I love the holiday season. In my family it’s the one of the few times a year that we would get to host the whole family at our house. Uncles, aunts, cousins and grandma would surround the table waiting for the amazing feast that my family had slaved over. It’s a time of love, family and delicious treats! Family visits and holiday parties are the perfect excuse to make some of my favorite desserts that I don’t see very often during the rest of the year. Apple pie has GOT to me one of my favorite desserts of all time! Honestly who doesn’t like apple pie? Its one of those things that it wasn’t the holidays if you didn’t eat apple pie. Apple pie is one of those dishes that you can taste the love in every bite. While its filled with so much holiday love, it’s also a dessert that can take a while to get perfect. First you have to make the filling, then the crusts. Then put them together. Then bake. Then wait until it cools. Then serve in equal slices. Are you as exhausted as I am just reading the steps? I LOVE apple pie, but I don’t love how much effort it requires. 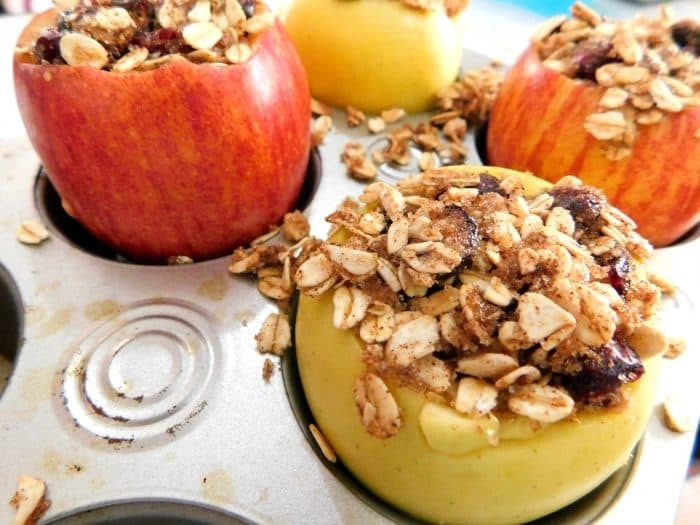 These stuffed baked apples pretty much make themselves in the oven. The chewy crumble only asks for a few ingredients and no kneading required like a traditional crust. My secret ingredient to add a little extra umpf is a handful of dried cranberries. They add the perfect tartness to these baked balls of sweetness. 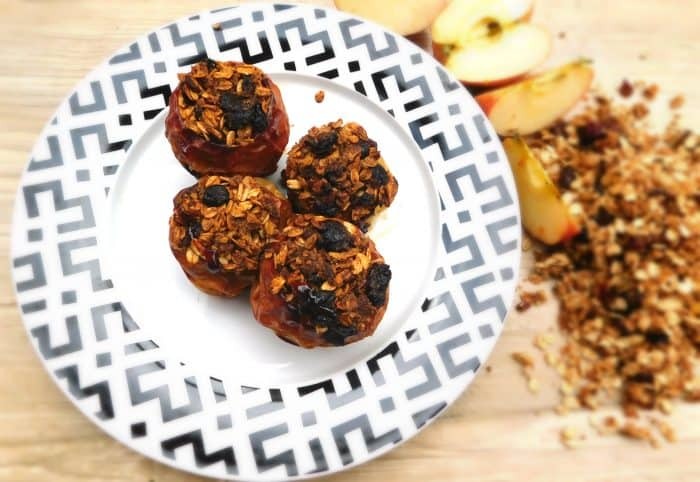 These baked apples are one of my favorite desserts because they allow me to focus on what is really important during the holiday season: family and friends. A dessert that comes together so easily is always a winner in my book because that means I won’t be slaving over a hot stove and get to enjoy more time with the people I love most. Core apples, making sure all the seeds are removed. Remove a little more flesh of the apple so that there is more room crumble. In a large mixing bowl, combine all other ingredients until fully incorporated. 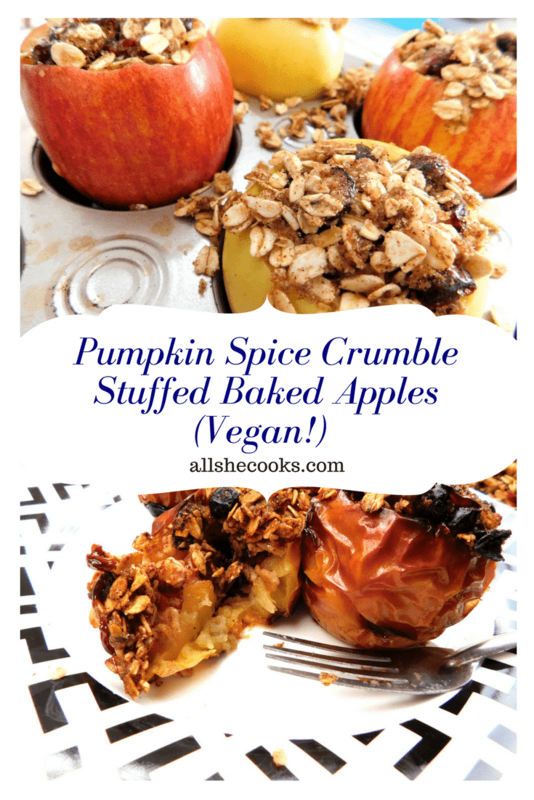 Stuff apples with crumble. Try to pack down the mixture as much as possible. 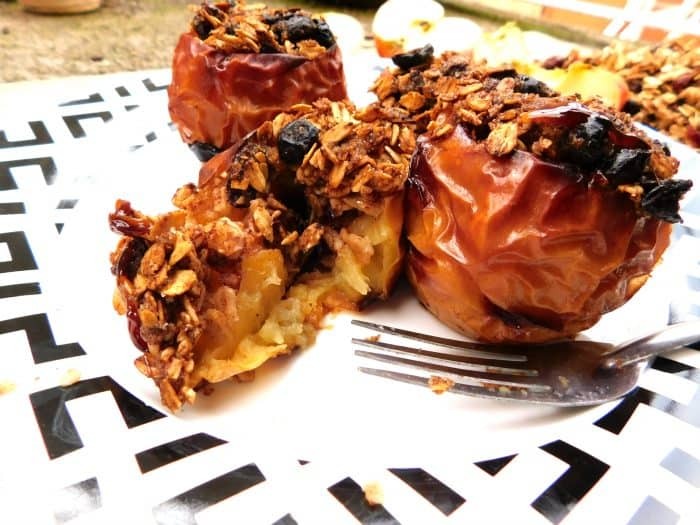 Bake apples in a 400 degree oven for about 30 minutes or until the apples are softened. Enjoy! Yum! I bet these two flavors together are amazing. I’m a sucker for pumpkin spice anything. So in my biased opinion I’d have to say HECK YES they are! !